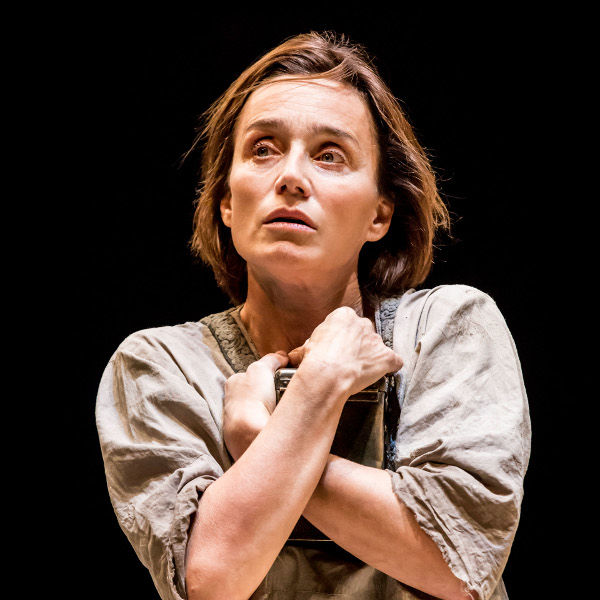 There is no doubting Ian Rickson and Kristin Scott-Thomas make a formidable team; in their four collaborations they have covered Pinter to Sophocles by way of Chekhov, walked off with an Olivier award and garnered a hatful of plaudits. Electra, at the Old Vic, may be the least balanced of the Rickson/Scott-Thomas productions but it is hard to deny the towering performance at its centre from Scott-Thomas that cements her place as a first rate stage actor. The story of the death of Agamemnon, the duplicity of Clytemnestra, the debasement of Electra and the return of Orestes is one that retained a mythic quality from its origins in Homer and its reappearance in the Delphic Oracle before it found itself reimagined over and over as theatre found its voice and as Aeschylus, Sophocles and Euripides began to create the traditional boundaries of drama. It is a story that would’ve been well known to its ancient audiences, and just as modern directors continually reinvent Shakespeare so we find ancient Greek playwrights going back to the original myth and reframing it for a new generation. The curious thing about the Old Vic’s version is that it has lost something of why the story would have been regarded as essential to an ancient audience. 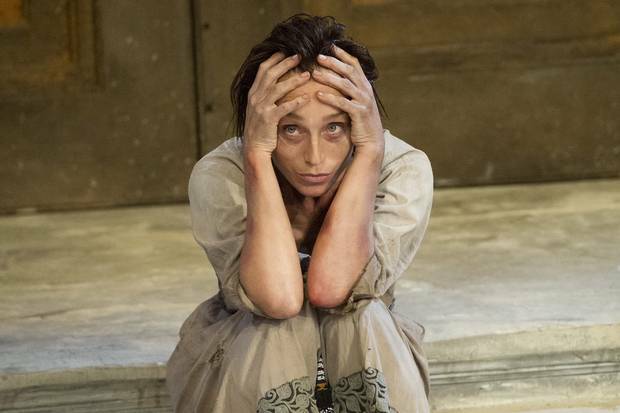 Often the disconnect is in modernity jarring too heavily with the ancient world; a problem found in the National’s recent production of Medea, and that ultimately saw Ben Power’s translation tie itself in knots and changing the ending to fit between the two positions. However in Frank McGuinness’ translation the problem is the reverse – whilst the play feels authentically ancient in set and language, the actual plot is strangely pallid. It is hard to know where the tragedy is in what we are watching. At its most basic level Electra has been treated appallingly, holds a grudge against her mother and new husband and circumstances change so that the mother and husband can die. The situation is tragic in the wider sense that it includes regicide and matricide but this is a royal family and, as Shakespeare’s Richard II astutely notes, ‘within the hollow crown / That rounds the mortal temples of a king /Keeps Death his court‘; should we really think it tragic that this kind of action takes place? It feels barely comparable to the sweeping tragedy of Antigone or Oedipus, or the lurid tragic bloodbaths of Euripides’ Medea or The Bacchae. However when one rejects the notion that this is a tragedy as one normally understands it, a subtler, more psychological play begins to emerge. 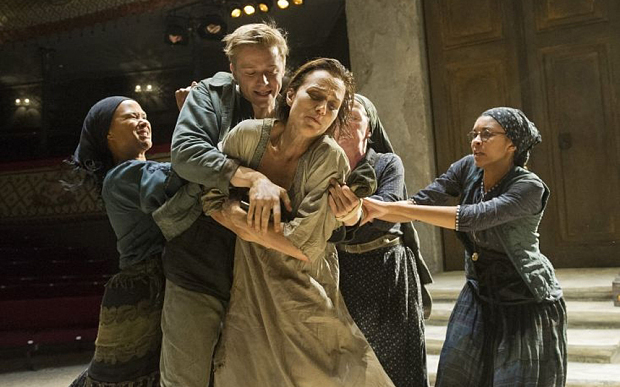 Whether it is McGunness’ words or Sophocles intent but Electra is the immovable object at its heart; on-stage for practically all of the play, Scott-Thomas’ Electra has the look and feel of one who really had been prostrating themselves in front of the court daily since the death of Agamemnon. The unmoving physical presence is matched by an unmoving psychological strength; to speak of regression into madness would be incorrect, instead her father’s murder has placed her in a state of arrested development. She has aged physically but does not seem to have moved forward mentally. One sympathises with Clytemnestra to the extent that Electra has the unwavering self-righteousness of a sullen teenager. She refuses to see Clytemnestra’s reasoning for killing Agamemnon even though it relates to the brutal sacrifice of Iphigenia, her sister. Scott-Thomas captures this position superbly; she appears wan and dishevelled but able to summon up spite and sarcasm at will. There is a pithy humour in her fury and a withering contempt in her relations with her sister and mother that makes her palpably human. Electra has become a living, breathing flawed creation, albeit one that has almost cracked through her grieving – the reveal of Orestes brings a wonderful moment where Scott-Thomas takes on an animalistic quality, snuffling around his body as if she holds the memory of a scent where her eyes deceive her. At times the actors around Scott-Thomas do become slightly marooned as her presence isolates the stage and forces attention upon her. They are credible performances but Ian Rickson doesn’t given them enough to leave an impression; in the same arena as Scott-Thomas, their performances occasionally come across as line recitals. The exception is Diana Quick’s Clytemnestra; she channels a pragmatic maternalism and brings a delicate ambiguity to the role. The audience are left assuming that she had Agamemnon murdered for reasons most foul but her justifications are persuasive enough to leave a sliver of doubt in the mind. Overall Ian Rickson’s Electra is a very solid production that is strengthened by Mark Thompson’s set which establishes the ancient world with effortless simplicity, whilst also being so universal that it moves into the realm of symbolism and gives greater weight to the timeless, universal qualities inherent in the tragedy. It also contains a powerful compelling performance by one of our great actors that is worth whatever other flaws the production may contain.